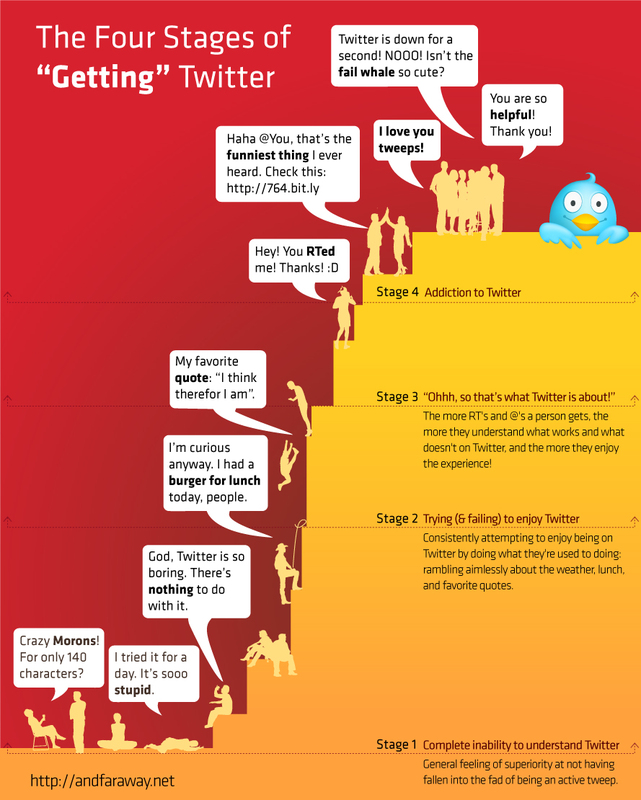 Twitter – Which stage are you…? Personally, I’m stage 4. Via AndFarAway blog. The best advertisers for your product are satisfied customers. American Express captured that concept brilliantly in 30 seconds, using ‘Tweet Stories’. Membership has it’s privileges. For the first time ever, Mercedes Benz is advertising in the Super Bowl – and doing it in a fashion that is fitting for the times… a full on Social Media blitz, which they’re calling the Mercedes Tweet Race. This campaign coincides with their 125th anniversary and is compelling if only for the fact they are rolling out some amazing new models. The grand prize for the individual with the most followers in the Tweet Race? A brand new, 2012 C-Class Coupe. Not too shabby… if you have the scratch to pay for the taxes on that prize. I’m a bit late in writing this post, as the ability to enter the race has closed. However, if you’d like to learn more and see who’s pulling away – head over to their Facebook page and ‘Like’ the MB Tweet Race tab. Mercedes is not the only auto manufacturer blitzing the Super Bowl with Ads, as nearly 1/3 of the available 63 spots are car centric, according to Brand Week. Can’t wait for the commercials… oh yeah – and the actual game itself! Today, eMarketer released a study from the Center For Market Research on the adoption of micro-blogging by the Fortune 500. The increased adoption (60% of the Fortune 500 is now leveraging Twitter – up from 35% a year ago) shows the evolving importance of using this platform for customer service, promotion, and overall engagement with users of their brand offerings. We, at Intel, leverage Twitter significantly to engage with our users, answer questions, and promote new marketing campaigns and product launches. We’ve found it to be an effective tool to ensure that we are always available to the needs of current and future customers. What’s been great to see is that the Twitterverse is 1) Interested in what we have to say 2) Takes advantage of the opportunity to engage back with us and 3) Helps amplify our messages that they find interesting by retweeting or commenting on key exchanges. This is a trend that is only going to continue to grow, and is an important means for value exchange with our user base. I’m a HUGE NBA fan… and even bigger when my beloved Boston Celtics are involved this late into the post season. I take every opportunity to poke my friend and social sparring partner, Michael Brito, who moved on from Intel (Boo!) and joined Edelman not long ago. He’s also an unabashed Laker fan so the poking is warranted. We’ve been going back and forth over Twitter over the last couple of weeks as our favorite teams navigate their way through the playoffs. Had I known about Nike Basketball’s Post Season Twitter page, I would have channeled my energy there in an effort to disparage more Laker fans in one fell swoop! 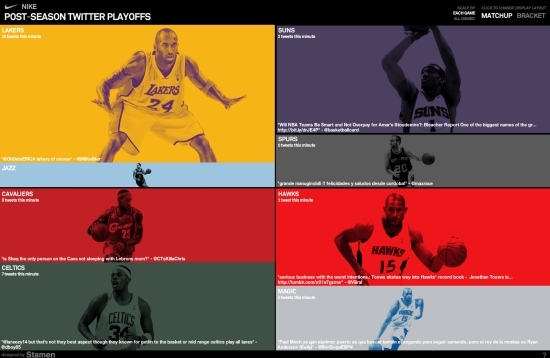 Nice execution – bringing people’s passions for sport to a socially relevant medium. Hats of to Stamen Design – I worked with them a number of years ago for our Digg Arc visualization – glad they are continuing to innovate. In my role at Intel, I am presented with some pretty unique digital marketing opportunities. One of my favorite was working with the team over at Digg on creating a new visualization in their Digg Labs environment – called Digg Arc. 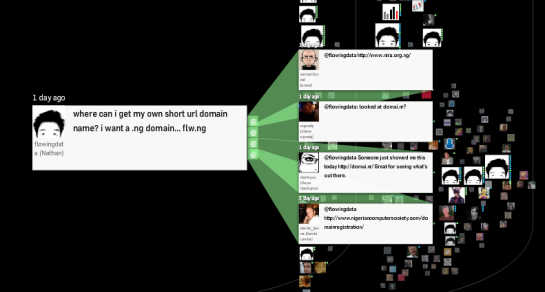 This was a real-time visualization of the top content being ‘Dugg’ on the main Digg site. It’s an interesting way to digest content and show the threading of how it’s rising in relevancy as your watching the infograph expand, shift, and change. 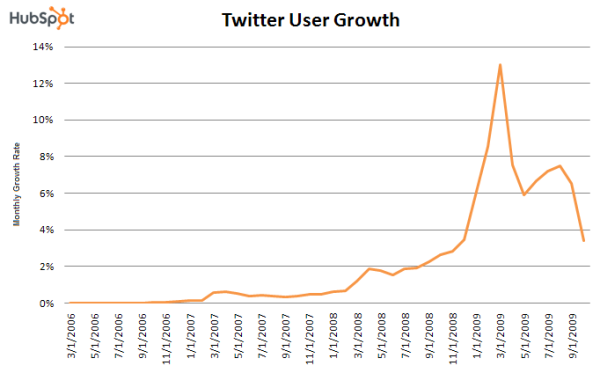 December 2009 was the first month Twitter processed more than one billion tweets (with 1.036 billion tweets). 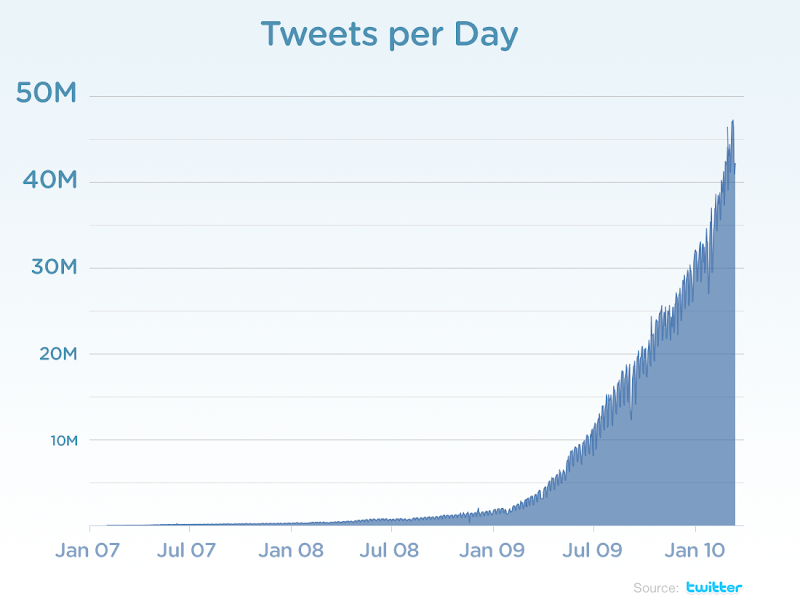 January 2010 had 16 times as many tweets as January 2009. The activity on Twitter has doubled since August 2009. January 2010 saw more tweets per day (39.5 million) than the whole of September 2008. 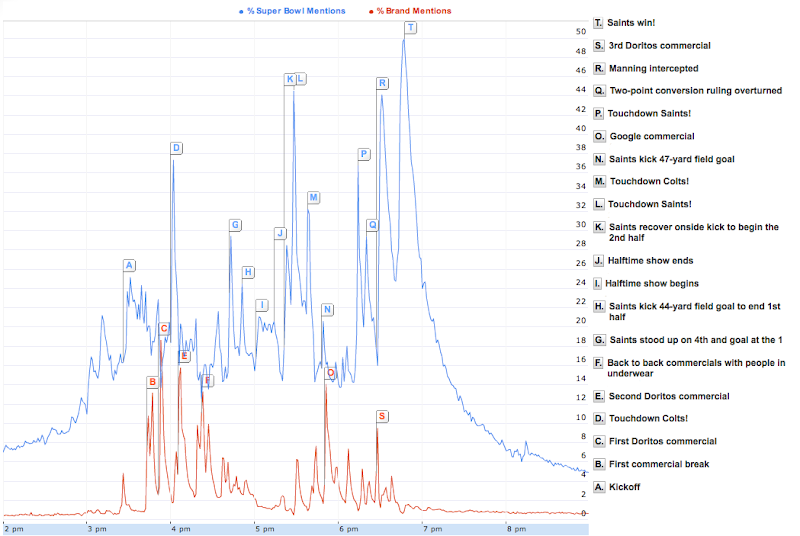 On the Twitter Blog yesterday there is a great chart that compares and contrasts Brand mentions and Super Bowl mentions on Super Sunday. The winning brand? Doritos – hands down, with the largest per minute volume of commercial related tweets. This begs the question: During a large event can we use Twitter mentions about brands in conjunction with ratings data to triangulate how many people not only saw, but also took a vested interest in how a brand has affected them during the larger viewing experience? I believe we can, and I think that you will see the use of this hard data be a complement to institutionalized ratings as brands seek substantiation of audience engagement.